The glaring surprise here is Gary Harris. MSU's best defender had a team-worst game by far. And we're not talking a game that was just slightly worse than the team DRtg; Harris' DRtg of 115.2 was +13.2 compared to the team's. He did force five of Virginia's 37 field goal misses but he allowed 3.5 of the Cavaliers' 20 makes and was responsible for six made free throws. 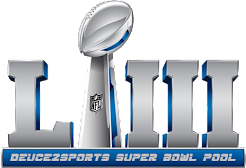 Couple that with his somewhat of a disappearance on offense and this will not be a game Harris watches anytime soon - unless he's searching for motivation. The numbers don't quite show it but I thought Virginia's Joe Harris was sensational. His biggest job was sticking with Gary Harris around screens and not allowing the above-mentioned star get going offensively. Whenever Harris curled off a screen (or two, or three) the other Harris shadowed him and made life miserable. Unfortunately, the DRtg doesn't really factor in "shot attempts prevented due to smothering defense." So, Harris only gets credit for half a field goal stop compared to 2.5 makes to go with a free throw. Speaking of sensational, boy is Malcolm Brogdon going to be a special player. He's so active defensively, whether it's on-the-ball defense or just seemingly always being in passing lanes. He also has underrated hops which resulted in a spectacular block that thwarted a MSU fastbreak attempt. He posted a team-best 93.2 DRtg (+10.1 compared to his team) and was the key reason the Cavs had a realistic shot to win late. Please don't take this as any more fuel for the "Travis Trice should start instead of Keith Appling" fire, but the Spartans will be just fine at point guard next season with the ball in Trice's hands much of the game. 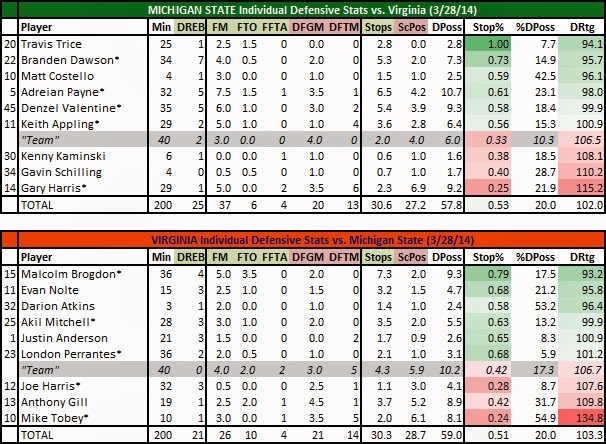 Appling is the better overall defender, especially on the ball, but Trice has the knack for forcing turnovers and being in the right place in the right time in help-side defensive situations. Against the Cavs Trice didn't allow a made shot and was responsible for 25 percent (1.5 of 6) Virginia turnovers. Over the past few years defense has been the big knock on Trice but he's proven this year, more times than not, that he's closer to an elite defender than a defensive liability. In the 10 MSU games I charted this season Trice was MSU's best defender four times. That's incredible considering defense is his "weakness."